I know you shouldn’t love something for the packaging. It’s shallow, meaningless and downright silly. 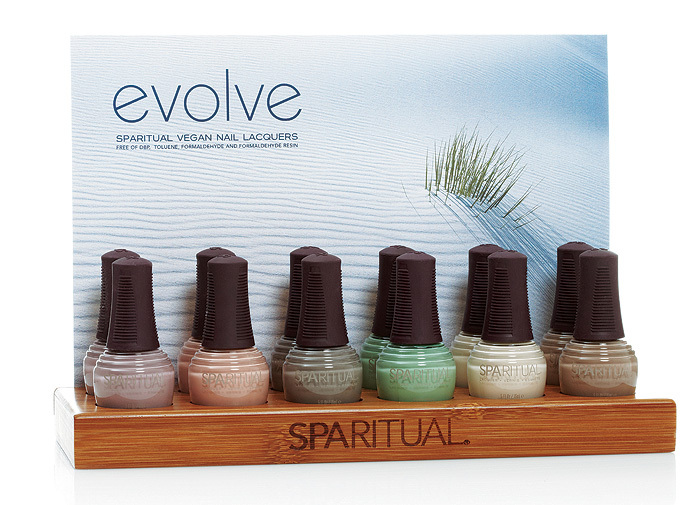 But I do love these SpaRitual polishes in particular for their packaging. The rubberised handles with built-in grips, curvacious bottles that kinda remind me of ancient urns or something. Pebble is a beautiful grey with just a hint of brown. Not enough to make it a taupe… but enough to warm it up a touch. The above swatch shows three coats but you could get away with two thicker coats as the coverage is more than acceptable as was the application. It’s a very laid-back Summer offering with no brights in sight but the Driftwood and Moss look particularly interesting. I was also sent Native Rock from the new collection which I’ll show you later in the week. Are any of the shades from the new Summer collection catching your eye? 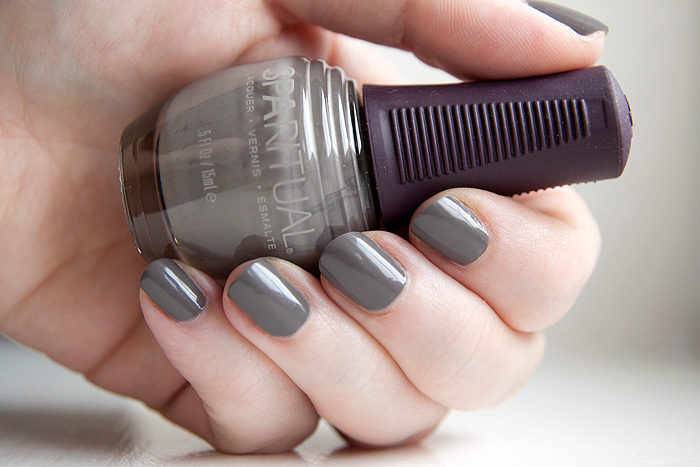 SpaRitual nail polishes (£8.50) are available to purchase directly from the SpaRitual website and spas/salons. Love this look of this whole collection, I haven’t tried any Spa Ritual but I will have to check these out. I still haven’t gotten into the whole shatter polish, I may try a silver one but I’m undecided. Love the colours en masse. Wish I had some of this brand. Totally agree about rubber grips. Orly have good ones too. Design is SO important. The little clip on my new iPod nano just takes it from excellent to A MAY ZZING! Pebble looks gorgeous and I love the look of Moss too. What top coat (if any) are you wearing. It looks so glossy! I’ve never tried this brand of lacquer before. They’re all so pretty! I love brights too but lately these sort of grayed out dark pastels (a la the Pirates of the Caribbean collection from OPI) have been jumping out at me. I don’t have any Spa Ritual polishes as of yet, but these may have to be my first! I love that color, the touch of warmth to the gray makes it so much more wearable than a straight gray! I think those little details are often the difference between loving something and just thinking it’s alright. There are so many brands to choose between, and so many similar products, that when a brand goes the extra mile, it actually gets your attention! I love “pebbles” and “native rock” and I’m also quite interested in seeing “driftwood” swatched. I really like the sparitual nail polishes, I own 6 or 7 of them. The whitish ones are very sheer and I’m thinking of selling these, because I don’t like sheer polishes. But the colorful ones, the purples and teals, are very nice. The rubberised handle really gives a good grip. You don’t have to feel silly because you fall for the packaging – I do, too. Last Chance to win a Beauty Blender! A new blog to follow and a LFW montage from ghd!